Abu Dhabi National Energy Company (Taqa) and Chromasun, a US-based solar panel manufacturer, have begun a pilot project for roof-top solar air-conditioning in Abu Dhabi. Taqa installed 27 Chromasun micro-concentrator (MCT) solar panels on the rooftop of Abu Dhabi Transmission & Despatch Company (Transco) in Abu Dhabi yesterday (January 13). The concentrated solar panels will provide clean renewable solar energy to the building’s air-conditioning system during peak demand hours. 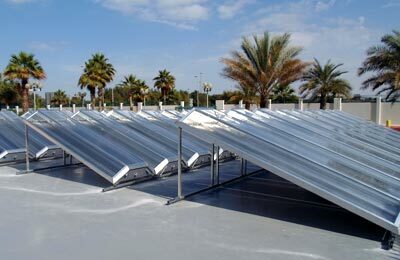 The Chromasun MCT technology is designed specifically for rooftop application and operation in high temperatures and dusty conditions, producing more energy per unit of roof area than many other technologies. Taqa is an investor in Chromasun and currently holds an 8 per cent stake as part of its efforts to develop post-pilot phase alternative energy technologies with breakthrough potential.